Summary: When Sarah Brown, daughter of abolitionist John Brown, realizes that her artistic talents may be able to help save the lives of slaves fleeing north, she becomes one of the Underground Railroad’s leading mapmakers, taking her cues from the slave code quilts and hiding her maps within her paintings. She boldly embraces this calling after being told the shocking news that she can’t bear children, but as the country steers toward bloody civil war, Sarah faces difficult sacrifices that could put all she loves in peril. I should probably begin this review by saying that I adore Sarah McCoy. Not only did I love THE BAKER'S DAUGHTER -- you can read my review here, but I think she's a wonderful person! I couldn't wait to read her latest novel THE MAPMAKER'S CHILDREN especially when I learned that part of the novel takes place prior to and during the Civil War, one of my favorite time periods for historical fiction. 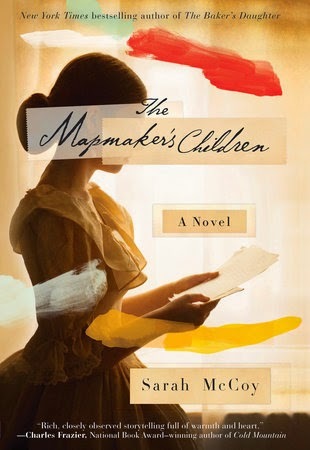 THE MAPMAKER'S CHILDREN explores the life of two seemingly different women separated by almost 150 years. The novel gradually reveals that these two women have more in common than what first appears by revealing the ways they deal with love, loss, sacrifice, and family. Sarah Brown is the daughter of John Brown, the abolitionist who helped slaves escape before losing his life at Harper's Ferry. After an illness leaves her unable to have children, she decides to make her life worthwhile by becoming a mapmaker for the Underground Railroad. She makes many sacrifices, some of which are dangerous, to help this worthy cause. And then there's Eden, a woman who lives in the present day. She has recently moved from the city to an old house in a small West Virginia town and put aside her career in public relations. She is married to a good man, but because they have been struggling with fertility issues for years, their marriage is starting to feel the strain. When Eden discovers a porcelain doll head hidden in her basement, she begins to explore the history of her house only to find that it might have been a crucial stop on the Underground Railroad. As both women's stories unfold, the reader discovers that they have some unlikely parallels in their lives. I enjoyed THE MAPMAKER'S CHILDREN quite a bit although I'm not sure I liked it quite as much as THE BAKER'S DAUGHTER... but that would be saying a lot because I loved that story! I appreciated the quality of Ms. McCoy's writing; and I definitely enjoyed how the story went back and forth between these complex characters' lives. It was very interesting for me to discover how these two women's lives not only intersected, but also how similar some of their insights and actions were. I mentioned earlier that one of my favorite settings for historical fiction is the Civil War. Of course, I'd read anything Ms. McCoy wrote, but this element of the story definitely piqued my interest. While I have studied and read quite a few accounts of the Underground Railroad, I really liked the approach Ms. McCoy took with featuring a woman who was responsible for much of the mapmaking. I was especially interested in learning about the role the dolls played in the story. In addition, it was apparent to me that the author really did her research for this novel. She includes some details in the back of the book that I found rather interesting; however, she also demonstrated it through her use of the letters that went back and forth between Sarah and her friend. There is no doubt that the Civil War was a horrific time for our country, but I think Ms. McCoy did an excellent job in bringing the pain and sacrifice families faced during the war. Another special aspect of THE MAPMAKER'S CHILDREN was how well Ms. McCoy brought Sarah and Eden's characters to life. I have to admit that I didn't always agree with how they handled everything in their lives, but I will say that I found their portrayal to be realistic. I thought Eden's struggles with infertility seemed very authentic; and as a result, I was more understanding of some of her actions. It's no surprise that THE MAPMAKER'S CHILDREN would make an excellent book club pick! There is a reading guide available with twelve thought-provoking questions. Some of the themes you might want to explore include infertility, loss, grief, sacrifice, second chances, motherhood, prejudice, war, social change, art, and stories. You also might want to incorporate some of the fun activity ideas for your group that are listed below the questions. THE MAPMAKER'S CHILDREN is an entertaining book that links the past to the present. It's not only interesting from a historical perspective, but it will touch your heart and make you think. Highly recommended! Wasn't this great? I loved the way she wove the two stories together.